Jazz@Rochester has been on Twitter for a long time and is closing in on 11,000 followers. 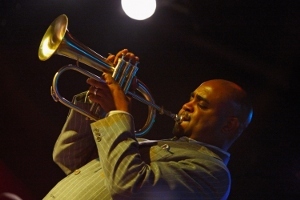 We follow local jazz artists, jazz artists from elsewhere with a local connection, and more than a few of my favorite artists, websites, blogs and other jazz information sources. There are a number of the artists (in jazz and other genres) on Twitter appearing at this year's Xerox Rochester International Jazz Festival and so far I've found 90 of them and added them to a Twitter List. I'm afraid I regrettably have had to leave some off due to the noise their feed creates in the list (Erykah Badu's @fatbellybella account, with over 1M followers, just drowns everything out...). It can be fun checking in on what XRIJF artists are doing before and after the festival, sharing relevant insights about them with my followers, and letting the artists know how much I enjoyed their performance at the festival. If you'd like to join that conversation, just click on the "tooting Tweeter" (or is it honking...?) to the right to check out our Twitter List and add it to your favorite Twitter client (or of course follow it directly on Twitter), or just follow the Jazz@Rochester Twitter feed (click on the blue Twitter bird at the top the middle column under Connect with Jazz@Rochester to check that out). If you're appearing at XRIJF 2016 and are on Twitter and not on the List, please tweet to me (or contact me through the site) and let me know and I'll add you. We've been on Twitter for a long time at Jazz@Rochester, with over 5,800 followers (more every day), and following local jazz artists, jazz artists from elsewhere with a local connection and more than a few of my favorite artists, websites, blogs and other jazz information sources. There are a large number of the artists appearing at this year's Xerox Rochester International Jazz Festival who have a Twitter account. Many of them actually tweet themselves ... really! Thanks to the XRIJF staff, who kindly provided all the Twitter handles, we have them all (although I'm sure there are more, so please share if you got'em). 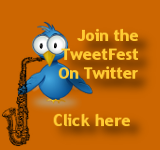 Click the "tooting Tweeter" (or is it honking...) to the right to check out our Twitter list page or add the XRIJF 2013 Artists Twitter list to your favorite Twitter client (or of course follow it directly on Twitter). Join in the conversation with your favorite artists. See what they're saying before and after the XRIJF. I'll be sharing, too, so just watch the Jazz@Rochester Twitter feed (if you want to check that out, click on the blue Twitter bird in the middle column. On the weekends, the first show at the clubs like Montage are increasingly likely to have a line form early. This one was well on the way to snaking around the corner onto Chestnut when I poked my head around to look almost an hour before Stafford took the stage. Although the Stridex comment was probably a bit stupid for a number of reasons, members of Terrell Stafford's Quartet were mostly still studying in college. His drummer, whose solos just cooked, graduates from high school on Tuesday! Although young, Stafford's quartet was tight and played a great set. While Stafford's playing on trumpet and flugelhorn was outstanding, he would often step back to let his companions shine through. The Reformation Lutheran Church was a great place to hear this music. By the time I got there there was next to no seating. While some friends slid over to give me a seat, I felt I was cramping them and realized I'd probably drive them crazy with pulling my phone out to tweet or check on other things while listening (see what I mean how it's starting to get in the way...? ), so I moved back to the back and leaned against the wall. Nordic Connect, fronted by sisters Ingrid and Christine Jensen was perfect for that space. I had heard the wonderful solos that Ingrid had played when here with the Maria Schneider Orchestra and her trumpet and flugelhorn playing was again superb. Her sister's interplay on sax at times seemed to weave in and out of each other so you couldn't tell who was playing. While it wasn't for everyone, I enjoyed it and it was just what I needed right then. This is one of those instances where the immediacy of Twitter makes for a egg-stained face. I just came in and sat in back to hear some of the SMV set with bass gods Marcus Miller, Victor Wooten, and Stanley Clarke. I remember Clarke from his earlier days as pretty slim and don't know much about Marcus Miller (have an album). I just assumed that Stanley was in the middle (as he is sort of the "leader" of this supergroup), but couldn't really see well enough. Of course, then the guy I was tweeting was Clarke, introduced Stanley Clarke. Oh well. Insert foot ... in mouth. I only caught a bit of this set, but Miller and Wooten trading fours was probably sending the bass heads in the audience into something close to ecstacy. After running over to the ticket shop to get a ticket for my wife for one of the Taj Mahal/Susan Tedeschi show that was about to sell out, I came over to the Big Tent and just sat down for awhile until some friends showed up to catch the 10:00 pm of Jon Cleary & the Absolute Monster Gentleman. Cleary is a student of New Orleans music and his set was like a history lesson taught by him, Professor Longhair and other NOLA musical legends. He had people on their feet dancing within minutes. He is a madman on the piano, singing with a lot of soul and apparently moving so much while he plays that they duct taped his piano lid to keep it from falling while he played. He plays again tonight. I did other tweets yesterday, mostly "retweets" of information and links or replies to other posters. Twitter is clearly not for everyone, but there is a growing community of jazz musicians, jazz venues, and other lovers of jazz on this microblogging service and it is a great way to quickly get information out, share the experience of an event with others (potentially thousands), and even to meet some of those people in person which is why it is called "social media." Check out the TweetFest widget here to check out or follow the conversation. 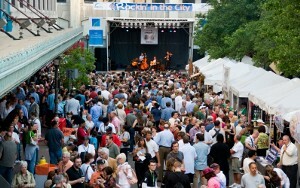 The folks at XRIJF are also on Twitter.